Lyn, I have one of the load and go cards for buying from the internet and they are great for working within a budget. If you really want to watermark your photo's then you should be able to put a diagonal watermark across the photo instead of just at the bottom, but to be honest Lyn I don't really see the point, there are already thousands of photo's / videos of you available to practically anyone on the internet, for instance I know you posted alot of photo's/ video on the other budgie site, they will be there for eternity, the only thing you can do now is to protect your personal photo's in your photobucket account with a good strong password and have a separate password for your photobucket account, it is up to you to decide which photo's you would like to share with others and which to keep "locked away" in your photobucket account so others can't see them. Something else you have to remember Lyn, how many videos have you posted on YouTube, with a very basic internet search I have found videos of the outside of your house, the inside of your house, videos including your Mother and videos of you with Indi, we know which town you live in, what more does someone nasty need to cause you problems if they wanted to. Deb knows where I live from my IP address, everyone else knows that I live in Doncaster, trust me Doncaster is a big place. Please don't get me wrong Lyn, I am not having a go at you, but you do have to be careful what you share online, watermarking your photo's is sadly not going to make a difference but strong passwords are a good deterrant at least, my TB password is 10 characters, a mix of letters , numbers and other digits, you wouldn't believe my online banking password, lol. Thanks for this timely reminder, Deborah! Unfortunately, it seems I have confused members rather than clarifying the matter regarding internet safety and especially the issues involving PhotoBucket. With regard to photos and videos that have already been posted on this forum or any other, I would simply leave them "as is" at this point if you want the threads and posts you've previously made in the forum to remain intact. As I mentioned earlier, all photos/videos posted previously on this forum or any other social media site have already been gathered by various internet browsers and moving or deleting them is not going to "erase" from the internet now even if they no longer appear on this forum. Moving photos from one album to another in Photobucket breaks the original image link and makes it so that the photo/video is no longer visible in past posts on our forum. Removing or moving your photos now causes problems with our contest threads and various other threads because pictures that the poster obviously WANTED to share at the time they posted are no longer able to be seen. You will simply see a blank box saying something along the lines of: "Sorry, this photo is has been moved or deleted". People moving/deleting pictures causes more work with regard to contests because I now have to try to ensure I have copied the photo and put it in MY Photobucket Account and then use MY image code for that picture in the contestant threads because otherwise members moving or deleting their photos affects those threads in a negative way. 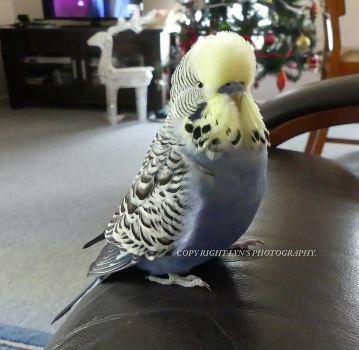 Lyn, I see no reason for you or the majority of Talk Budgie members to be concerned with "watermarking" photos of pet budgie photos or any other pictures you chose to share. You obviously want people to see and admire those pictures or you would not have originally shared them - right? 1. Breeders who use photos in their webpages and need to ensure their pictures are not used by other sites by individuals trying to pass the birds and related information off as their own. 2. Any person posting photos they have taken for the purpose of selling/exhibiting or using in a professional manner. Again, my purpose in bringing up PhotoBucket accounts when I mentioned Internet Safety was simply to remind all parents to be aware of when and how they share pictures of their children or personal details that might allow their child or family to be exploited. Let me know if this still doesn't make sense and I'll see if I can somehow explain it more clearly. Last edited by FaeryBee; 01-04-2015 at 10:41 AM.